All time Remote Lock / Unlock operation. (By chirp(s) when Disarming) Auto-Rearming. backward warning ( new improved feature ). 2 seconds while Arm, siren 4 seconds ). Defective zone Identification & Bypass. 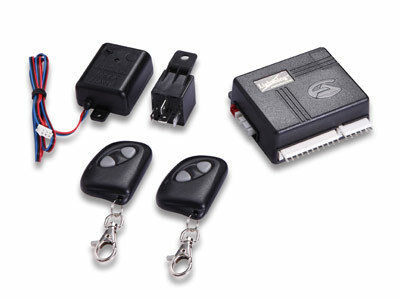 (Ignition off / On-Lock / Unlock)- programmable. DIRECTLY CONNECTION OF L&R turning indicators. Ground Arming output ( -500 ma ) for optional starter kill relay. Learn up to 4 Transmitters. (3 pin/) Inductive sensor. Multi-status indicating LED. On-Board Door lock control Relays. On-board EEPROM to prevent code from losting. enter function selection mode ). Remote sensor bypass. Silent Arming Mode ( programmable by Remote ). Valet Parking ( Valet or Service Modes ). Valet / Emergency override Switch.